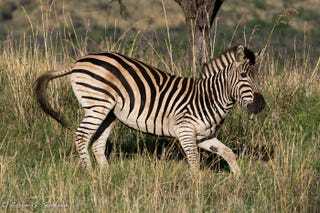 Compared to the other animals in the African bush, the zebra might get overlooked by some. But I think the three zebra species - Plains, Mountain, and Grevy's - are some of the most visually striking animals in the world. Here are a few zebra photos from my reporting trip to South Africa. Each of these photos - they're all Plains zebras, the most common of the three species and the only one listed as "least concern" - was taken at the Nambiti Private Game Reserve.